This book was published for the 'art meets science' exhibition of the same name at the Shirley Sherwood Gallery of Botanical Art at the Royal Botanic Gardens, Kew in 2009/10 to celebrate Kew’s 250th anniversary and Darwin’s bicentenary. The exhibition (and the book) provides an overview of plant relationships based on contemporary scientific discoveries and DNA test. Both contain 136 botanical paintings from the Shirley Sherwood Collection, by 84 artists, cover 44 orders of plants in 118 families, and a total of 134 species, providing a sweeping overview of the evolution of plants on earth. The paintings display a sampling of the plant world from fungi to daisies, including algae, mosses, ferns, conifers and flowering plants arranged in the most up to date evolutionary sequence, determined by recent DNA analysis. 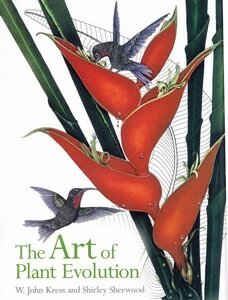 HIGHLY RECOMMENDED This book emphasises the scientific aspects of botanical art and makes it accessible. It's an excellent book and one which deserves to be on the reference shelves of every serious botanical artist. It provides all botanical art lovers with a comprehensive education in the botany of plant groups and families alongside numerous excellent examples of botanical art. 320 pages; 292 x 225mm. Dr Shirley Sherwood has been collecting contemporary botanical drawings from around the world since 1990. Her comprehensive collection includes work by artists living in over thirty different countries and documents the emergence of a new wave of botanical painters and the renaissance of their art form and is arguably the most important private collection of twentieth century botanical art in the world.